Alloy Steel STC Low-Capacity S-Beam Load Cells from Celtron are ideally suited for batching and filling, conveyor and hopper/tank weighing. The STC low capacity model comes in capacities from 50 lb to 200 lbs and includes 20' of cable (non ntep). Meanwhile, NTEP approved versions and sealed to IP67 are available in capacities from 250 lb to 20,000 lbs. The STC is ideally suited for batching and filling and hopper/tank weighing. Comes with 20 ft of cable. 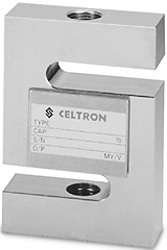 See specifications pdf below for more details about the Celtron STC s-beam load cells.